This is the final recipe in my Spring Shower Post line up. These brownies are super sweet and super rich. You will need to plan ahead a bit as they need to refrigerate for at least 6 hours. Leaving them in the fridge overnight is even better. She is a treat making diva. All of her goodie recipes are exceptionally fabulous. She’s pretty exceptionally fabulous herself! 1. Line the bottom of a 9×13 pan with tin foil and grease it with butter. 2. Microwave the unsweetened chocolate and butter for 30 seconds at a time, stirring after each cooking interval. Keep cooking and stirring until the chocolate and butter are melted. Set aside. 3. In a mixing bowl (or in your stand mixer) beat the eggs, sugar, vanilla, salt and almond extract for 3-4 minutes. 4. Add the melted chocolate mixture and flour. Mix until incorporated. 7. Spread half of the batter into the buttered pan. 8. Unwrap your peppermint patties and line them up over the top of the bottom layer of batter. 9. Cover the patties with the second half of the batter. 10. Bake at 425 for 23 minutes. This part is a little tricky. Stick a knife in the top layer of brownie and be sure that it comes out clean before you take them out of the oven. 11. Cool on a wire rack and then refrigerate at least 6 hours. Oh my gosh, these sound amazing! Oh, these do sound so yummy! I haven't had York patties in a long time. 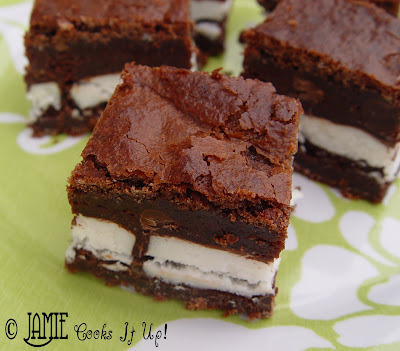 It's time to change that with these brownies. Thanks for sharing this great recipe. What a great website! I cant decide what to try first! Do you by chance have a good reeses cupcake recipe that has the crumbled up reeses on top? Im doing a dessert bar for my wedding and would love to have them but there are so many recipes out there…. Hope this helps! And good luck with all of your wedding plans. This is an exciting time for you! Ooooh! Love these! I have a similar recipe from my favorite foodie mag. I have found that you cannot use generic–must use York Peppermint Patties–or they melt to smitherines! Have you had a similar problem & if so how did you overcome it? I haven't ever tried it with a generic brand, but I am glad for the heads up! I'll add that piece of info to the post. Can I ask a question? I know it says chocolate squares, but how big are your squares? I have a hershey unsweetened chocolate bar that has 1/2 oz squares and bakers chocolate that has 1 oz squares. I am not sure which one is the standard measurement. Help, please?! The recipe calls for eight 1 oz squares. Good luck. Hope they turn out well for you! I did make these and they were awesome! I took them to a neighborhood BBQ and they were the star! Thanks for the great recipe and for the help on the question, too! I love your blog, I can't wait to try this recipe, please advise what size bag of peppermint patties are used in this recipe? I'm so glad you are going to try these! I bet you will love them. You just need the regular sized bags. Not the large bag. Sorry I don't know the exact size in ounces! Good luck! Let me know how they turn out. I'm so sorry your brownies turned out doughy and wet. That is so frustrating. The sugar and flour increments are correct in the recipe. It really has a lot of sugar! If you try again, I would cook them at 400 degrees for about 35-40 minutes. Don't take them out until you can insert a knife into the middle and it comes out clean. Some ovens take a bit longer to cook, my guess is that the cooking time listed above wasn't long enough for your particular oven. So sorry about them not turning out. That can really put a kink into things. Good luck! TRYING THEM TONIGHT!!!! SO EXCITED! Do I need to keep them refrigerated even after the allotted time? Since I doubt we'll eat 'em all tonight? Seems like not, since they don't have anything in them that should require constant refrigeration. Roxanne Feb.13,2012 Can you use box Brownie mix? I'm not sure if a brownie mix would work very well. My thoughts are the batter (and then of course the dough) would end up being a bit too thin to support the peppermint paddy. I recommend sticking with the recipe. Hi, I can’t wait to try this. My only question is how much ounces were the York bags. Thank you.